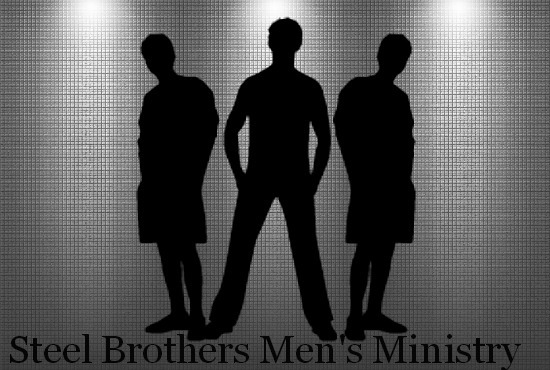 After much prayer and even more listening to the spirit of God, the name for this men's ministry and conference to come was revealed as "Steel Brothers" Men's Ministry. You see, "steel" is a strong metal made two things, iron and carbon. Pure iron is soft, but the carbon that is mixed with it causes it to harden greatly. This is achieved through a refining process. It is that same refinement process that we will go through daily as we continue to grow stronger in the Lord. God is working on us, His holy spirit ministers to us. We are being refined, shaped, and molded into men of God, strong vessels for the Lord. Isaiah 64:8 "Yet you Lord are our Father. We are the clay, you are the potter, we are the work of your hand." Steel is also refered to as having a quality of mind or spirit as in the phrase "nerves of steel." But as a verb, "steel" means to fill with resolution or determination. God is refining us, and we are to be transformed daily as it says in Romans 12:2 "Do not conform to the pattern of this world, but be transformed by the renewing of your mind..." Renewing your mind is a process. and the verse continues to say "Then you will be able to test and approve what God's will is--his good, pleasing and perfect will." As men, especially men who are trying to live a Christ filled life simply trying to live and overcome the sterotypes whether good or bad that society has painted for us can be challenging, but it's not impossible. God has called us to be set apart for his purpose, so those narrow margins and guidelines don't hold us anyway. God is calling us forth to be good husbands to our wives, good fathers to our children, good sons to our parents, and good brothers to our siblings. God is calling us to rise above the levels of being thuggish, rough, unconcerned and uncaring, and immature in our behavior. This is a part of how society views us as men. God is calling us to take command of our bodies and not continue to father children that we want no dealings with because we don't like or care for the mother, or worse simply created in the midst of a heated night without regard to the consequeces of our actions. God is calling us from the streets, calling us from the jail cells and prision yards. God is calling us from our parents basements and our friends couches to stand up and be the God-fearing, capable men, spirit-filled, and righteous men that we should be in order to take our places as the head of our families, to gain the respect that we so desire to have among men. God wants us to rise up and be the "Steel " that is made for creating stability in our lives, for not only ourselves, but our families, communities, and one brother at a time, having a positive natural and spiritual impact on society. God wants us to be durable and strong enough to withstand some things, and that includes the temptation that comes upon our flesh as well as the test and trials that come with life, that we don't cave in, don't give up as soon as things get hard, but fight for your survial with a spirit-filled mind, being filled with the knowledge of God and his wisdom to direct us. We all as human beings, men and women have flaws and fall short of God's glory, but it doesn't mean we cant improve on things that are negative. Acts 11:24, “For he was a good man, full of the Holy Spirit and of faith.” - This is a passage of scripture which describes Barnabas who was referred to a "good man."